One of the Major Ryokans in Onsen Town Togura-Kamiyamada. "Yuzan" is the flagship of the Yuzan Group in Togura-Kamiyamada Onsen. 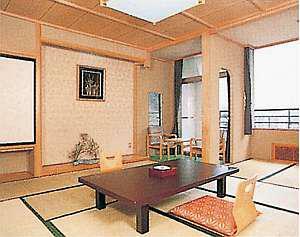 A Japanese ryokan combined with the comforts of modern construction, Yuzan's traditional Japanese-style guestrooms are a spacious 12-14 tatami mat size. Billiard, ping pong and karaoke rooms on the premises. 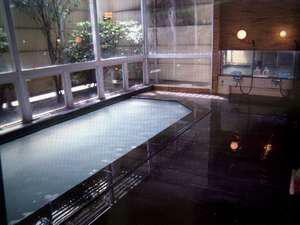 Guests can enjoy the onsen baths in Yuzan as well as the baths in partner lodging Hotel Platon, a 3 minute walk. 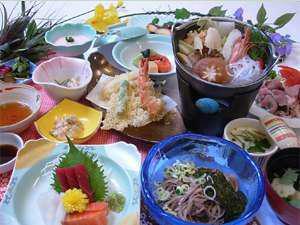 ¥10,000 per person based on double occupancy for accommodation with full kaiseki style traditional Japanese dinner and Japanese style breakfast. From Togura Station(Shinano Railway), 10 minutes by bus (#9, "Joyama Iriguchi"　城山入口 stop). Free shuttle service available 14:30-17:30. To walk (2.6km, approx. 30min), proceed west from Togura Station 100m to Togura St. signal and turn left onto Route 18. Go south 1.2km to Togura-kamiyamada-onsen signal and turn right onto Route 498, and follow as per above. From Sakaki IC, proceed straight 2.5km down Route 91 to Sakaki Inter signal. Turn right onto Route 18 and go north 6.7km to Togurakamiyamadaonsen signal. Turn left onto Route 498 and proceed west 1.4km crossing the Chikuma River to Joyama signal. Turn right onto Route 77 (Joyama-dori). Go 2 blocks (120m) north and turn left. Yuzan will be on the right.